Varieties in dosas are never ending! A lot of mix and match can be done to make them more attractive and healthy. This time I used beetroot for a nutritious dosa. Soak dal, rice and methi seeds for 3 hours. Using a blender, grind to soft batter. Add jowar flour, salt and give a good mix. Make sure there are no lumps. Adjust consistency by adding water. Ferment for 8 hours/over night. Just before making dosas, peel and grate a small beetroot. Grind it to a fine paste. Mix this to the dosa batter. Alternatively, add 2 tbsp of beetroot powder. 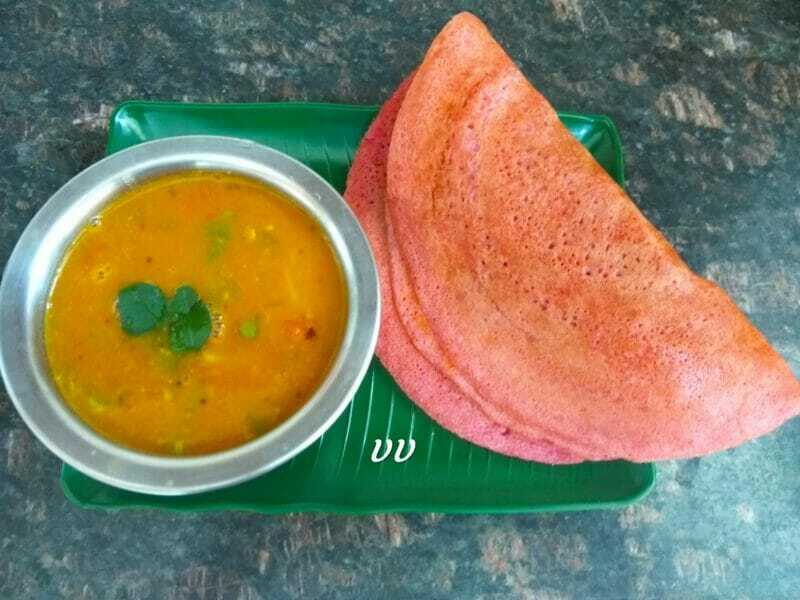 Make dosas and serve with sambar/Chutney. Can the dosa batter be used the following day by refrigerating it just like the normal dosa batter? Yes, you can as long as you don’t mix beetroot puree to the batter. Millets tend to become sour fast. So it is better to grind just for day or two. if am using the grains whats the proportion for jowar dosa? You can use 3/4 cup of grains. Soak for atleast 5 hours.